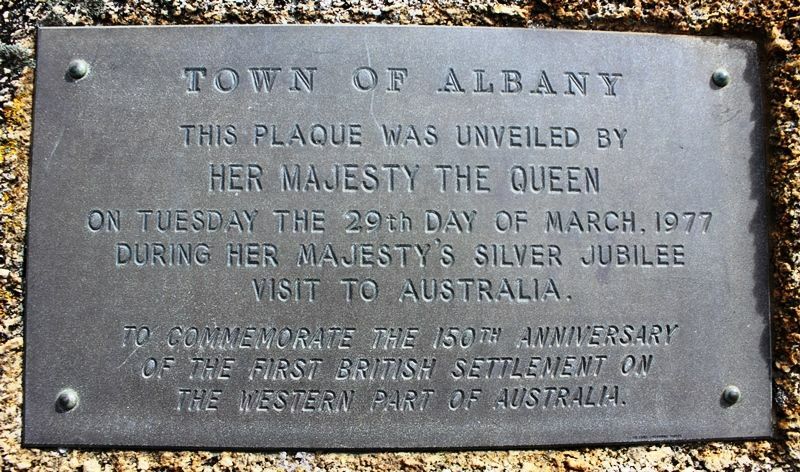 The plaque unveiled during Queen Elizabeth's Silver Jubilee visit to Australia commemorates the 150th anniversary of the first British settlement in Western Australia. On the 9th of November 1826, Major Edmund Lockyer, together with a contingent of convicts, soldiers, a surgeon and storekeeper, left Sydney aboard the 'Amity' bound for King George III Sound. The Amity arrived on Christmas Day 1826. Lockyer selected the site of what is now known as Albany for the crown and thus formed the first Western Australian settlement. Major Lockyer named his new town 'Frederickstown', after King George III's second son, His Royal Highness Prince Frederick Augustus, Duke of York and Albany - 'The Grand Old Duke Of York'. This plaque was unveiled by Her Majesty the Queen on Tuesday the 29th day of March, 1977 during her Majesty's Silver Jubilee visit to Australia. To commemorate the 150th anniversary of the first British settlement on the Western part of Australia.